CrossFit Marketing and Onboarding Plan to grow your membership. CrossFit affiliates need a marketing and onboarding plan so they can attract a steady stream of leads to their gyms. And like other small gyms and health clubs, CrossFit gyms usually need some help to get moving in this area. As an owner of a CrossFit affiliate for 10 years now, I’ve grown a gym from scratch. After moving to a new location last year, we grew our membership from 110 members to 230 in 8 months. 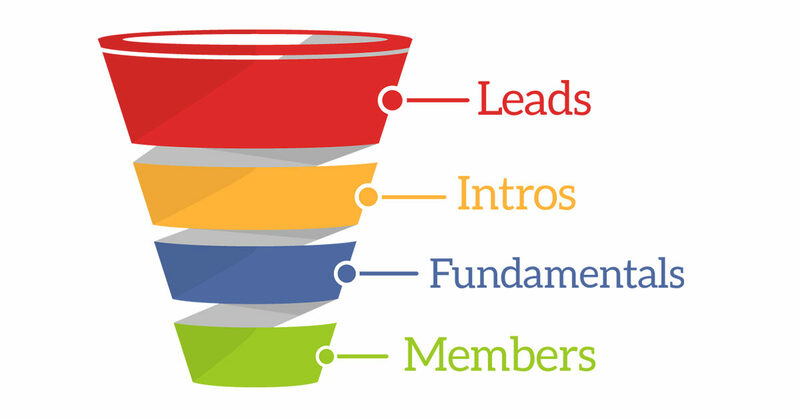 To get the most out of your marketing you need to move as many of your leads as possible through the process of becoming a member (also known as ‘onboarding’). If you don’t have the right system in place you are wasting your marketing dollars. First, you need to know your ideal client. For most CrossFit gyms, the membership pricing for group classes is $100 to $200 per month. So, your marketing needs to emphasize that this is a premium offering and target people who are willing to pay for this. CrossFit’s tagline,“Forging Elite Fitness” supports this nicely. Second, attract the clients who will stay. While it’s generally true that it is cheaper to keep existing customers than it is to get new ones, this is even more the case for a CrossFit gym as it is something that people pay month-to-month. Admittedly, these ‘high lifetime value’ members cost much more to acquire than people who will just churn out after a month. As such, you should be prepared to pay more for a lead. (To that end, we will also need to put a good retention strategy in place to dramatically reduce our initial marketing costs after we fill up our gym.) Don’t worry though, there are cost-effective ways of attracting even high-value clients, as you’ll soon see. Now that we know our ideal client, let’s get started. Before you place any ads, the first thing you need to do is create an optimal offer to get new members into the gym. If your offer isn’t something people want, no amount of marketing will get them in the door. Most CrossFit gyms offer a free trial class and this can be very effective. I have also seen others offer a free week of training. Experiment with offers that work best in your area, and with the ideal member you’re trying to attract. A discount can be part of a good offer but be careful not to be so cheap that you attract people that aren’t willing to pay your premium pricing. Sometimes the price is the marketing and people will perceive something as less valuable if the price is too low. The job of the offer is to get potential customers in the door so they can start developing a relationship with your business. Initially that’s with the coach but it will eventually be the community as well. As such, at my gym we try to get them into regular classes as soon as possible. Your ad will need to convey your offer and – in the case of online advertising – the landing page that follows a click needs to align with it. A well thought-out landing page allows prospects to up after seeing your ad; you can then follow up with them. You could also use a service like LeadPages or Unbounce to create a landing page. 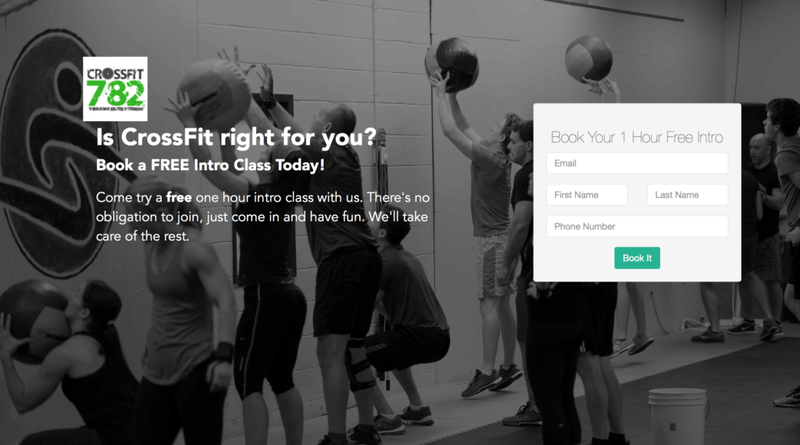 Another option is to design a specific page on your gym’s website as a landing page. The opt-in form you see above prompts users to submit their information (simply asking for an email address is also fine) and they immediately receive an email from us. We use OnRamp to automate our lead tracking and emails, but if you are using something like LeadPages you can likely set up a campaign between them and an email service like Drip or Mailchimp to automate things. Tip: In the event a person clicks on your Facebook ad to go to the landing page but does not provide their contact information, you can specifically retarget these ‘warm’ leads by placing your Facebook Pixel on the landing page. Once you start gathering leads via your ads and landing page, you will want to contact them as soon as possible to book their first session at your gym. This ensures you’re building a relationship early on and ‘striking while the iron is hot’, as they say. In OnRamp we have automated the bookings piece so that the ‘thank you’ that page leads land on after entering their information prompts them to book their first Intro class. You could also set things up so leads are immediately emailed once they opt-in. This first booking should be followed up so leads continue to keep your gym top-of-mind. We follow up with a confirmation email, a reminder email the day before the booking and a text message the morning of the appointment. In OnRamp, if the coach confirmed for the booking has connected his or her Google Calendar, it will also add the booking to the leads Google Calendar. This confirmation process dramatically reduces no shows and gets more people into our gym. We also reach out to these leads personally to see when they might be available. This is streamlined by using saved replies that include class times and directions, so I don’t have to spend a lot of time writing emails. After a lead attends the Intro class, we move them out of the first email sequence and into a new ‘Intro’ sequence. You could use a simple spreadsheet to track leads, changing their status so you can see where they are in the process. An email automation tool will allow you to move leads between email sequences with ease. Each of these emails contains a prominent call to action linking to a Fundamentals sign-up page. Again, you could also have emails in the sequence explaining what people get with their membership and/or how your prices compare. In OnRamp we have additional sequences that go out when the person confirms a class time, asking them what their goals are and reminding them of their booking (by email and text). Tip: If you want to see all of the emails that we use in OnRamp, click below to get the New Member Messages Starter Kit. With your offer, landing page and email sequences planned out, now you can start going after leads. Now the fun part: creating ads to attract potential members to your gym! Targeting the right audience with your ads is crucial. If you target the wrong people, your offer may not interest them or they may not be able to pay what you are asking. Depending on what options each ad channel gives, you can experiment with combining various demographics to improve your targeting. Before you even spend any money on Google ads there are some free things which can boost your rankings in Google’s search engine. First make sure you have a Google My Business page. This is what people see on the right of the screen when they type your business name into Google. Having an engaging picture and a good description makes a big difference. To catch the people who are searching for CrossFit in your area, you want to try to rank above the other CrossFit gyms in your area. One really effective way to do this is to get positive reviews from your members. I wrote this article outlining how we got over 30 five-star reviews, which pushed us to to the top of the search results for anyone in our area who Googled ‘crossfit’. While Google AdWords can be expensive, you can keep the costs down if you focus on local traffic. This is especially important if you are further down the search results. For a reasonable amount (we were paying under $20 a month) you can put yourself at the top of the list for anyone who is searching for CrossFit in your area. Put the offer in the headline of your ad and take leads straight to your landing page. Given that these people already have intent by actively searching for information about CrossFit, you should be able to get a significant number of clicks. Again, do the free stuff first. First, you will need a Facebook Page for your gym. This is easy to set up and should be updated frequently (a stagnant page without recent updates looks like you don’t care). Create a page for your gym here. Invite your current members to ‘Like’ your page and keep them coming back by posting lots of current information or just share cool CrossFit videos. This will get your page in front of more eyes, and more potential members. Do Facebook Live videos whenever you can. Don’t worry if you don’t like being in front of the camera – just download the Facebook Pages app on to your phone to do a FB Live of your members doing a fun warm up or a cool workout (make sure you save it as a post when you are finished). You can immediately share your video on your page and save it for future use, too. Facebook has been focusing on video and really promotes this content to people it thinks would be interested. Unlike Google, which is intent-based (where people are actively searching for CrossFit), advertising on Facebook is interruption-based (like a TV ad). This requires a different approach with ads that are more eye catching and engaging. One of the easiest ways to do an ad is to take a post from your page that a lot of your members are engaging with and do a ‘Boosted Post‘. For example, you could do a post reminding people about an upcoming Intro class, linking the post to your landing page. Then boost it to people in your area. The nice thing about Boosted Posts is they can cost as little as $5 to run for several days. So you don’t need to break your fledgling marketing budget but can test some simple Facebook ads from your page. Tip: When targeting an audience for your Boosted Post, use the ‘People Who Like Your Page and Their Friends’ option and limit it to local users. When friends of your members see the ad, they will also see that their friend has already Liked your page. This is great social proof (similar to a testimonial) and improves engagement. Plus these people are more likely to stick with it if they have a friend who is already training with you. Video is extremely engaging. Don’t worry about not having a professional videographer on hand – just do it with your iPhone. People on Facebook tend to scroll past the professional looking ads and engage more with video that looks like something that their friends have created. Once you create a Campaign and Ad Set (your targeting), you can create a Video Ad by uploading a video file or using one already on your FB Page. As I mentioned above, Facebook Live videos are another great way for bringing traffic to your page. You can turn these videos into ads and retarget viewers based on how much of your video they watched using Facebook’s Custom Audiences feature. You can create a custom audience in Facebook with people who have watched at least 3 seconds, 10 seconds, 25%, 50%, 75% or 95% of your video. This is a key part of your advertising strategy. With Facebook, you can advertise directly to people who have already interacted with your ads or content. Think of this as a warm audience (as opposed to a cold audience where people have never heard from you before). Since these warm audiences are already familiar with your gym, they are more likely to engage with you. Tip: Retargeting ads including testimonials from your existing members can be extremely effective in recapturing previous leads at a very low cost. You can then create ads based on the level of engagement with these warm leads. These audiences are also smaller so you don’t have to pay as much to reach them. To retarget a Facebook user, you need to define a Custom Audience. This can be done with either Video Engagement or using a snippet of code (called a Facebook Pixel) that you can insert onto your website. Find out more about FB Pixels and Custom Audiences here. I usually plan to devote $5 to $15 a day to Facebook ads, from which I can expect to get 10–20 clicks each day. As I build up my custom audiences, I will then split this budget between ads to cold audiences and retargeting ads to warm audiences. Apart from Facebook, having an Instagram account for your gym helps capture the younger audience that uses this platform. My 19 year old daughter manages our gym’s Instagram (since she is better at it than I am). On our Instagram feed we post pictures often as the gym grows, and only occasionally promote deals to get people to come in. People are sensitive to promotional materials on Instagram, so it’s important not to “pitch” followers too often. Going forward we are going to be taking a more structured approach, doing things like Movement Mondays (where we do an Instagram Stories demonstrating a CrossFit movement) or Takeover Tuesday (where one of our members will take over the account for the day). Since Facebook gained ownership of Instagram, ads can now be placed on Instagram using Facebook’s Ads Manager. Given the way the platform is used, there are some differences (for example video ads have to be less than 60 seconds on Instagram). You can also do 15 second video ads on Instagram now as well. Referral marketing is one of the best ways for businesses like CrossFit gyms to grow. The gym is a social environment and as such people like to have their friends with them. In addition to being a great source of new members, it also significantly improves retention of your existing members. 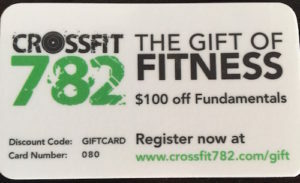 A couple of years ago we ran a referral program where we gave each of our members a ‘Gift of Fitness’ card that they could give to their friends. In addition to giving their friends $100 off Fundamentals (normally $135), we also gave the member $100 off their own membership renewal if their friend ended up joining. This was a great way to build our membership but it took a ton of time to administer. So we automated the process to make it easier to run. There are lots of referral marketing tools out there if you’re interested in this approach. If they click on the first answer we send them to a page where we thank them and ask them for a positive review (see the section above on getting Google Reviews) or to send a referral to a friend by simply filling out an email address or sharing on Facebook. OnRamp can then track which leads were referred by which members. Another way to do this is to send an email telling members how your referral program works, including any incentives. You could then follow that up with another email outlining how referrals help build their gym community. We continue to stay in touch with any leads who have not come in for an Intro session as well as anyone who has come in for an Intro and not continued to membership. Occasionally, we will send out an email to leads letting them know about upcoming Intro sessions.We include them in any newsletters we send out as well. While these leads will eventually unsubscribe if they aren’t interest, we will also prune our list occasionally to take out leads that have not responded in some time. So we continually have an active community of leads who have the potential to be re-engaged with our gym. A marketing and onboarding plan is a great way to provide a steady stream of leads for your gym. By having a funnel in place, you can automate major portions of the onboarding work that you are doing, saving yourself time as an owner. By getting more leads through your onboarding process, you will get more out of your advertising budget. As you reach a critical mass, you can then scale back your advertising budget and rely on social media and referrals to push more leads into the top of your funnel. Why not join our growing community of CrossFit gym owners? You’ll get free content and other resources – all on our Gym Marketing Group. Join now!